Hotel Meyrick, in the heart of Galway City — has long been a dream wedding destination for both Irish and international couples. Native Galwegians will be familiar with the striking Victorian hotel, and those visiting the city for the first time won’t miss the grand building located just a stone’s throw from Galway’s lively city centre, making it the ideal location for your guests to explore all the city has to offer. 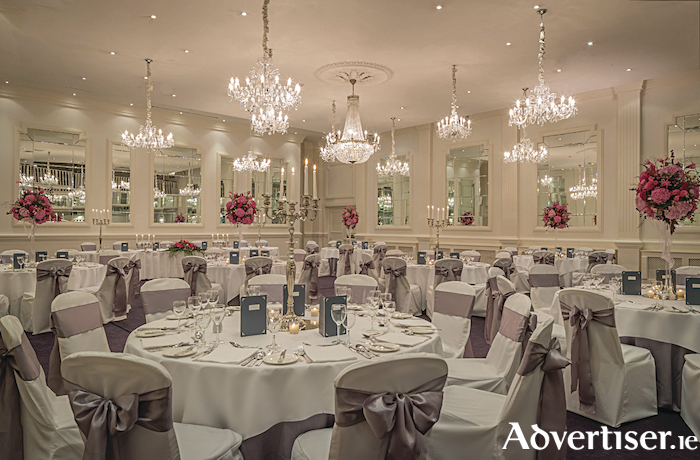 While Hotel Meyrick has a rich history, standing tall over Eyre Square since 1852; it is its modern-day reputation that makes it the ultimate venue for weddings in Galway city. Staffed with an experienced team of planners and a dedicated Wedding Co-Ordinator, Hotel Meyrick’s service is paramount to ensuring each couple has an unforgettable experience. Organising a wedding is a big undertaking, which is why Hotel Meyrick’s wedding team dedicates so much time to each individual couple. Their unparalleled expertise takes the stress out of the planning of the big day. The Connemara Ballroom is a breath-taking venue space, lit by nine shimmering antique chandeliers and dressed with elegant white sashes and chair covers. Table tops are adorned with mirrored centrepieces and silver candelabra. It caters for weddings of up to 300 guests. The hotel is also a licensed Civil Ceremony venue. Galway is renowned for its unique charm, inimitable atmosphere and warm welcome. Hotel Meyrick’s central location means many of Galway’s spectacular backdrops are within easy reach, ensuring stunning wedding photos. The picturesque Claddagh and Long Walk, Quay Street and the Latin Quarter, Salthill’s iconic promenade and the sweeping Galway Bay are just some of the scenic spots nearby. In the summer months the city is alive with festivities and offers the warmest welcome to guests. Hotel Meyrick is perfectly positioned to soak up the atmosphere of the city and on midsummer evenings, as the sun dips over the Atlantic, it’s an unbeatable wedding location. Galway is just as spectacular in the cooler months with a brilliantly festive atmosphere from the traditional Irish music sessions in cosy pubs, bustling Christmas markets on the hotel’s doorstep at Eyre Square and bustling laneways shimmering with festive lights. With its roaring fireplace, sumptuously furnished lounge and cosy bars Hotel Meyrick is a beautiful location for winter weddings. The Connemara Ballroom in particular makes a spectacular backdrop to a winter wedding. With their myriad of dining options, including their AA Rosette award-winning restaurant- No 15 on the Square, Hotel Meyrick is renowned for its culinary excellence. This same gastronomic expertise is applied to the bespoke wedding packages offered by the hotel, including a sumptuous five-course feast served with wine. Couples will consult with the Head Chef beforehand and create a personalised menu for their big day. Packages start at €52, ranging to €65 and can be tailored to incorporate any inclusions the couple wish to have. An unbeatable city centre location, stunning surrounds and seamless service from start to end; it might sound like a dream but the team at Hotel Meyrick are there to make fantasy a reality. The personalised service given to each and every couple makes planning your wedding just as unforgettable as the day itself. To enquire about holding your Wedding at Hotel Meyrick contact Paula on [email protected] or phone 091 564041, or view https://www.hotelmeyrick.ie/weddings-welcome.html .